Teena and I were at the Toronto Rock game tonight. 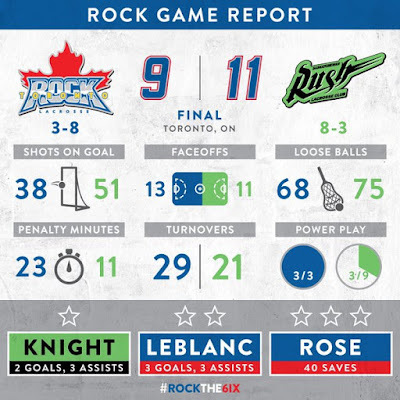 It was a rematch of the 2015 NLL Championship series when the Toronto Rock lost to the Saskatchewan Rush. It was a win the Rock really needed as their record was a disappointing 3-7 but they still had an outside chance to make the playoffs. As usual, Scotty Newlands did a terrific job on the Canadian national anthem. The Rock scored in the first minute of the game but then quickly found themselves down 3-1. Here's some action from the game. The Rock were down 3-2 at the end of the first and tied it up in the second. Iggy was hopeful and worked the crowd. Then it was time for the Toronto Rock Cheerleaders. Toronto took quite a few penalties in the first two periods and found themselves down 7-4 at the half. At the half, the kids came out. For the last minute of the game, they let all the kids onto the surface. It was fun to watch. The Rock came back in the fourth period to tie the game 9-9 with just 2:15 to go in the game. Tim and Gillian loved it! The Toronto Rock Cheerleaders thought the Rock could do it. The Saskatchewan fans in front of us thought the Rush could do it. Iggy thought we could do it. But the Rush fans were right and scored to take a 10-9 lead with just 26 seconds to go. After an empty net goal, things got rough. Once it was over, they all shook hands, as usual. And as usual, we cheered our team as they saluted us. The loss put us in dire straights about making the playoffs. It was a close game and a fun game but the loss hurt. The only reason the game was really as close as it was, was because Nick Rose (ROSIE!) made so many great saves to keep them in the game. The next home game is April 9 against New England. They play Vancouver in between. The Rock desperately need a winning streak.